Patriots top Blue Devils 25-13, 25-20, 25-16. With the win, Wootton clinched the top seed for the playoffs and the privilege to play Springbrook again in the first round. 10-0 Patriots capture 25-15, 25-23, 25-15 win against Clarksburg. First-year senior Aaron Krotman has never lost a volleyball match. Jeffrey Qiu and Justin Fowler have never lost a regular season volleyball match in their four years on the boys team, advancing to the championship match twice and semifinals once. Including its win against Clarksburg, Wootton's four year set record is 160-15 and match record is 53-3 (45-0 regular season, 8-3 playoffs). Wootton has won their Division Championship every year these seniors have played. With one more regular season match to be played, Wootton is positioned to earn the school's fifth consecutive #1 seed in the playoffs. This is a talented group of senior leaders with an impressive record earned on the court. And they now have big heads, though I can't think of a more humble group of young men who better represent their school, families and the volleyball community both on and off the court. Wootton travels to Springbrook on Monday, April 29 to close out the 2013 regular season against the Blue Devils. First serve is scheduled for 5:15 pm. Patriots stop Trojans 25-16, 25-20, 25-14; Remain unbeaten with 9-0 record. Inside the old gymnasium, banners and photographs on the wall give a history lesson on the school's success in athletics. The ceiling is pitched in the middle, running from wall to wall beyond the baselines of the basketball court. Exposed steel beams extend perpendicular to the roll-away bleachers across the court, and pendants hang from the ceiling with what seems to be seven or eight different color temperature medal halide lamps. Inevitably, at several times during a typical high school volleyball match, the ball careens with pinball-like action off the beams and pendants, though not on purpose. This was the last high school volleyball match in that old gymnasium. It was Gaithersburg's Senior Night and the well-coached Trojans played with fire and heart and mustered up a good old fashioned fight against the Patriots under that pitched ceiling, those beams, pendant lights, banners, while standing on a foundation of 62 years of tradition. All-County veterans Justin Fowler, Jeffrey Qiu, and Paul Malinauskas continue their stellar seasons. People notice them... for good reason. They have earned that. Senior veterans Henry Zhou and Charles Wang are making the point on the court that any talk about the county's top players is not complete if they are not mentioned as part of that discussion. First year senior Aaron Krotman has completed his transition from running receiving routes on the football field to running a quick middle attack on the volleyball court. He also is learning to tie his shoes. Wootton is working on improving it's vocabulary to break the huddle. It is not good. Please help. Junior Ben Wang keeps the ball off the floor. Junior Cary Chin kept his chin up in a rare bench performance against Gaithersburg after being sidelined with an ankle injury. We anxiously await his return. Sophomore Mark Pang hits the ball hard. And he is always ready to do so. Sophomore Richard Hum can play middle. And leftside. And rightside. And backrow. He did all of that impressively. Oh, and he can also set. And start for the state championship soccer team. And start at point guard for the basketball team. Sophomore Adam Kaplan is deceptively efficient as an opposite, and knows the right place to be in the back row, which, by formal definition, is where the volleyball is. His unique volleyball training with a hockey puck on ice with Wootton's hockey team must be his secret. Freshmen Aleks Psurek, Hunry Shu, and Justin Wu are still freshmen, so words must be tempered lest they become sophomoric. About them: After the daily grind of facing everyone mentioned above in practice, they use their opportunities when the get court time on game day. Wootton parted ways with the old gymnasium with a win and a few more memories. We'll look forward to playing in Gaithersburg's new gym in the future, where I'm certain a bunch of new banners will soon be hung on the walls...or from the ceiling rafters....or wherever volleyballs are sure to be flying. Wootton's Senior Night will be held at it's next match--the last regular season home match--against a formidable Clarksburg team. First serve is at 5:15 pm. Season record at 8-0 after 29-27, 25-14, 25-17 victory over Warriors. Patriots win at Blake 25-17, 25-13, 25-10; Win streak reaches 6. 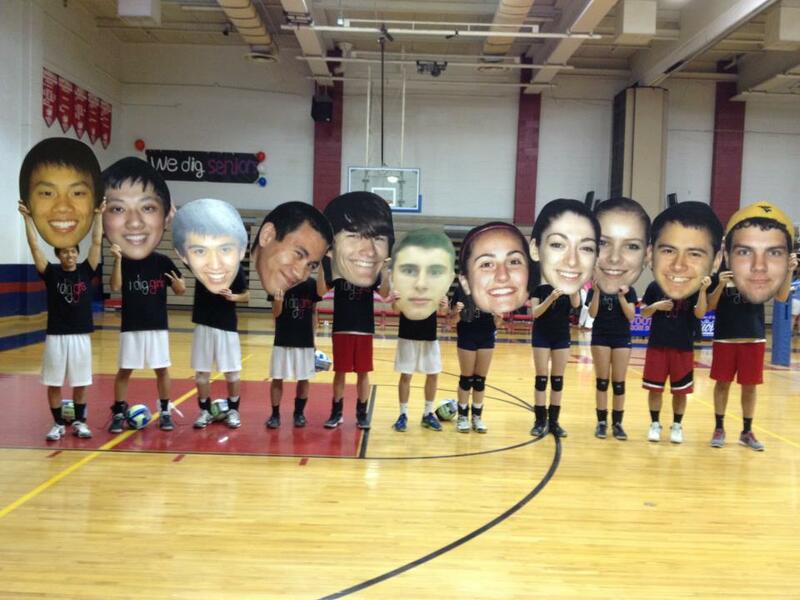 The Wootton High School boys and coed volleyball teams are enjoying a winning streak lately. After their 3-0 win at Blake, the coeds sport a 5-1 record and are in the thick of another division title race. With the boys' win at Blake, they are now 6-0 and poised to earn the school's fifth consecutive division title should they win their next match at home against rival Churchill (disclaimer: not an easy task). Is there a Wootton volleyball bandwagon? Maybe. At least, there was a bus. Oh, bus rides are a bit more fun if a team is winning. The Wootton volleyball teams rode the bus to and from Blake feeling pretty good about the season so far. There was joking banter. There were confident grins and loose temperaments. And for good reason. The boys had reached the season's mid point during the second set of the Blake match and everything seemed to be working right. There are fifteen players on the Wootton boys volleyball roster. Among them, a talented and veteran core, workhorse athletes, and emerging younger players that are developing as a unit that is more deeply skilled than at the start of the season. On the stat sheet, their individual productivity is measured as a set of +1, -1 or 0 rating for each touch on the ball. Each of the fifteen Wootton players was statistically a plus in the match against Blake. This was the first match that the Patriots reached this statistical milestone. A bandwagon? At least, it is progress. Leading the way were talented veteran seniors Justin Fowler, Jeffrey Qiu, Henry Zhou, and Charles Wang, along with first year senior phenom Aaron Krotman. Juniors Paul Malinauskas, Cary Chin and Benjamin Wang added versatility and firepower. Sophomores Richard Hum, Mark Pang, Adam Kaplan and Ethan Frymark made productive use of their playing time. Freshman Henry Shu, Justin Wu and Aleks Psurek kept the wheels turning forward on the bandwagon -- er, um -- for a Wootton victory. On bus ride home, Wootton celebrated and moved ahead of the traffic from the first half of the season. The second half of the season will be an uphill ride. On Friday, April 19, the Wootton boys play at home against Churchill. First serve is scheduled for 5:15 pm. Patriots win at home against Wildcats 25-10, 25-15, 25-17. Baseball Hall-of-Fame pitcher Walter Johnson enjoyed a sporting 21-year career with the Washington Senators, amassing strikeouts and shutout wins in record-setting numbers with his overpowering fastball. On Monday evening, Wootton played ball with Walter Johnson, not the player but the high school named in his honor for his life of sportsmanship, gentility and service to Montgomery County, where Johnson retired after his baseball career ended. The Wildcat volleyball team represented Walter Johnson well, but it was the Patriots who earned the shutout victory with overpowering hitting by Jeffrey Qiu, Henry Zhou, Paul Malinauskas, Charles Wang, Aaron Krotman, Richard Hum and Mark Pang. Ethan Frymark and Adam Kaplan contributed key blocks. Henry Shu added a spark with his agressive play coming off the bench. Benjamin Wang and Justin Wu steadied the Patriot back row. Senior setter Justin Fowler delivered another all-everything performance directing the Patriot attack in sets one and two. Junior setter Cary Chin played the role of closer in set three to preserve the shutout for the Patriots. Up next for Wootton is a division match at Blake High School (named for famous composer, lyricist and pianist James Hubert "Eubie" Blake), where the Patriots hope to fine-tune its team harmony..and all that jazz. First serve is scheduled for 3:30 pm on Wednesday, April 17. A starting lineup with one freshman (Henry Shu) and four sophomores (Richard Hum, Adam Kaplan, Ethan Frymark and Mark Pang) may keep a coach on the edge of the bench or pacing along the sidelines, but that was not the case in Wootton's inter-division match against Paint Branch. With junior Cary Chin taking on quarterback duties as setter and Benjamin Wang providing a spark with his back row play, the young Patriots stepped in the limelight and introduced themselves as the promising future of Wootton volleyball. Scratch that. The young Patriots introduced themselves to the fans as the players who are talented to give the veteran Wootton players a challenge every day in practice....now. Joining the young guys on the court for the first two sets was first year player Aaron Krotman, a senior who has worked his way from the football field to green volleyball player to red hot middle hitter to make an impact on Wootton's early season success. Hum and Pang were impressive on defense, passing and hitting on the left side. Frymark has showed remarkable progress as a first year middle hitter, while Shu has showed spots of brilliance in each of the essential skills. Kaplan has changed his hockey skates to court shoes and anchored the Patriots power play at the net and serving line. Chin took charge of running the offense with confidence earned from playing at a consistent high level. Of note: After a 5 point Panther run at the start of set two, the young Patriots rebounded with a high level of intensity--and fun--to close out the set with strong serving and hitting. Freshman Justin Wu joined in on the victory in the back row. Wootton's veterans Justin Fowler, Jeffrey Qiu, Henry Zhou, Charles Wang, Ben Wang and Paul Malinauskas, along with Hum and Krotman, led the Patriots to victory in set three. Kaplan came off the bench to stick a few serves and freshman setter Wu and blocker Aleks Psurek closed out the match. Though the Wootton veterans did not play as much, their impact was in full view as the younger guys displayed the skills and intensity they have picked up playing with and against talented veteran players every day in practice. Wootton plays next at home against Walter Johnson in a division match-up on Monday, April 15. First serve is scheduled for 5:15 pm. Sportsmanship wins on the volleyball court. After the Wootton Patriots-Rockville Rams volleyball match at Rockville High School, Rams head coach Sean Pang took his brother Mark home. Mark, a sophomore outside hitter for Wootton, had just played an impressive match serving and hitting against his older brother's team. In my role as Wootton's coach for the past six years, I have a bit of perspective of what it's like to compete against, then go home with a member of my immediate family. For three years my son Jacob played middle hitter for Wootton's rival Richard Montgomery High School. In the days leading up to the match, we would cautiously talk about how our season was progressing, though with an undertone of simmering competitiveness that made the Wootton-RM match that much more significant. We had our allegiances to our own teams, but what about the rest of our family? Do they hope for a win-win? The final score does not allow that. Whom do you cheer for? There is a simple answer: You cheer for family. Cheer for a competitive match. Cheer for good sportsmanship. Cheer for opportunities for growth and lessons learned. Cheer for individual and team performances edging closer to full potential. Sean and Mark represented that ideal on the Rockville court on Wednesday evening. Coach Pang's Rams and Mark and his Wootton teammates competed well on the court. A different family also played on the volleyball court on Wednesday evening in a show of solidarity and support after the sad news of Monday's passing of a fellow student-athlete. In our thoughts were the family, friends and classmates of Rockville lacrosse player Michelle Miller. That loss, stinging as it is, offered us perspective on the value of family, friends, and our fellow competitors. Wootton won a volleyball match 25-10, 25-12, 25-17. It was an opportunity to compete and grow and to learn a few lessons about volleyball and life. And, in a small but not insignificant way, sportsmanship edged family and solidarity closer to full potential. The Patriots take their season record back to their home court for a Friday, April 12 match against Paint Branch. First serve is scheduled for 30 minutes after the end of the 5:15 pm coed match. The sudden disturbance on Poolesville's otherwise quiescent free surface gymnasium floor was the solid object of a volleyball put into motion by the force of mass and velocity supplied by Wootton's attackers. How's that for a Wikipedia-referenced lead-in to a blog post? (groan). Set two marked the return of senior middle hitter Charles Wang, who hobbled through preseason and missed the first match with an ankle injury. Freshman Henry Shu made his impressive high school debut with a high degree of hustle. Hum switched from middle to the outside, and Qiu showed his versatility on the court playing right side, replacing Malinauskas. Qiu and Malinauskas demonstrated Newton's Second Law of Motion (F=ma) by inflicting "the net external force on the volleyball equal to the mass of that body times its acceleration." (groan, then learn more at http://en.wikipedia.org/wiki/Motion_(physics)). In other words, their smashes made more splashes. Fowler ran the offense at a level above his all-county performance of last season. Cary Chin took over setting duties in set three, with sophomores Adam Kaplan and Ethan Frymark making their season debut for the Patriots in the middle. Frymark and Kaplan created opportunities for themselves and teammates with aggressive play. Joining them were Shu on the outside and, in his debut, freshman Aleks Psurek on the right side. Veterans Qiu, Malinauskas and Ben Wang paced the Patriots before turning the set over to the younger players to close out the match. Chin provided capable leadership on the court by engaging all of the players in the offense. With a nod to Newton's First Law of Motion, the Patriots hope to continue to move with constant velocity when they travel to Rockville High School on Wednesday, April 10 in a cross-town showdown with the Rams. First serve is 30 minutes after the end of the 5:15 pm coed match.